"In winter of 1946, Errol Flynn purchased Navy Island for the princely sum of US$80,000. For the next decade that small swath of land, not even 100 yards from the beaches of Port Antonio, became the berthing place for Flynn’s yacht Zaca, and the staging point for his unending party that is today the stuff of legend. The entertainment Flynn featured most often in those days was a small local group called the Navy Island Swamp Boys which consisted of Noel Lynch on Guitar, Moses Deans on banjo and “Papa” Brown on rumba box. The mentos, calypsos and rumbas they played were the perfect soundtrack for Flynn & co’s bacchanalian excesses. When this group broke up in 1955, Moses and Papa reformed the group with Derrick “Johnny” Henry on maracas & drum, Martell Brown on guitar, and David “Sonny” Martin on guitar. When Papa couldn’t make gigs, Allan Swymmer was brought in (he later became a permanent member). Legend tells us that Errol Flynn named this group “The Jolly Boys” after the vibe he caught from their playing. With Flynn’s imprimatur, the Jolly Boys music quickly defined mento and calypso entertainment in Port Antonio and set a high musical standard. By the end of the 1960s, the Jolly Boys had became an important part of the north coast’s entertainment industry, often performing with dance troupes in floorshows for elite Port Antonio visitors. One of the dance troupes the Jolly Boys very often performed with was led by Albert Minott, a young man of extraordinary talent. Albert specialized in hand-walking and fire eating, and impressed his audiences with his daring feats, but he also loved mento music. When he wasn’t busy dancing alongside the Jolly Boys in the floorshows of the 1960s, he joined them on rumba box whenever he could. With the ascendence of reggae in the late 1960s, work slowed for mento bands. This forced the Jolly Boys to look for opportunity elsewhere and ultimately they split into two groups. 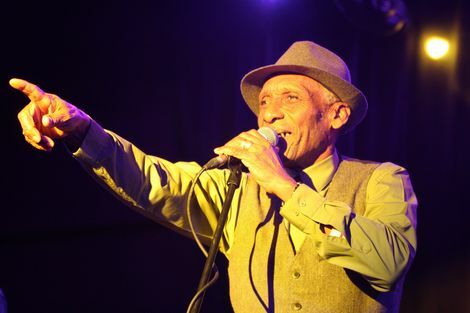 Allan Swymmer moved to St. Ann’s Bay in 1969 where he started his own branch of the Jolly Boys, while Moses took his Jolly Boys group to the Round Hill estate in Montego Bay for a series of annual gigs. During this time, both groups maintained a very high musical standards (as seen on the Jolly Boys LP "Lyrichord" released in 1977) and kept regular contact with each other. Then, in the early 1980s, Moses reformed the original Jolly Boys back in Port Antonio, with Swymmer leading on drum and Powda playing rumba box. They found abundant work in all of the parish’s major venues, including Jamaica Reef, Round Hill, Frenchman’s Cove, and Goblin Hill. But then, in 1989, singer-songwriter and producer Jules Shear saw the band during a visit to the Trident Hotel. Inspired, he recorded an album of their music and revealed their sound to a new generation of international listeners. Between 1989 to 1997, the group released a series of well known albums and toured internationally. On their way to being the most recognized mento band in the world, they even appeared in a scene in the film The Mighty Quinn, starring Denzil Washington. In 1998, the group embarked on a new phase of its existence. Shortly after Moses passed away, the group began playing regularly at GeeJam, a residential recording studio in Port Antonio, for the artists recording there, a group that includes Gwen Stefani & No Doubt, the Gorillaz, Drake and Amy Winehouse. When GeeJam opened as a hotel in 2008, Jolly Boys became its house band and impressed co-owner Jon Baker with their poise and vibe. With the idea of documenting their music for future generations, Baker teamed up with Dale Virgo, GeeJam’s in-house studio engineer engineer, to co-produce their current album, "Great Expectation". Despite their busy schedule in Port Antonio, the group is still very much in demand in Jamaica and beyond. For example, it was a featured act in the Institute of Jamaica’s Mento in May concert in Kingston in 2003; later that year, it performed at the Montreal Jazz festival. In addition Powda was a featured mento performer in Monty Alexander’s Lords of the West Indies concert at New York City’s Jazz at Lincoln Center in 2008. Still here in 2010, the Jolly Boys are truly timeless. With new members Donald Waugh on banjo, Lenford “Brutus” Richards on guitar and Dale Virgo on percussion, the group has a new sound and is ready to take yet another generation–and their bacchanalian excesses–by storm." Produced by Jon Baker and Dale Virgo. Executive Producers Mark Jones and Steve Beaver. Recorded at Geejam Studios, Port Antonio. Mixed by Tom Elmhirst, Geejam Studios. Featured guest artists include Cedric Brooks (flute, tenor sax) and Daniel Neely (banjo).